rulez added on the 2010-05-30 02:58:26 by ɧ4ɾɗվ. 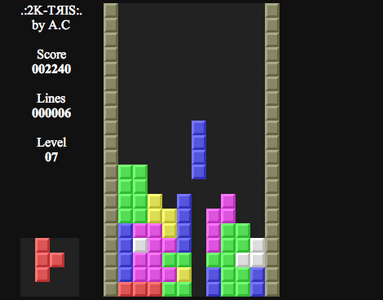 A game of Tetris a day keeps you happy! For what it's worth, I've added an iframe'd version here. meh, the gfx don't look as good as in the screenshot?! @toxie : The texts may vary slightly from one browser to another as the default font is used. Now, if you have a problem with the tiles, it's perhaps because your browser gets mad at the simplified DOCTYPE -- although I haven't observed that problem myself on any of the browsers I've tried it on. Will be there offline zipped version, like for Stack'Em? Very playable!, much like the old Gameboy one (the best tetris version imho). page created in 0.016676 seconds with 15 queries.